FONTANA, CALIF. (June 26, 2015) – Simon Pagenaud checked one thing off his to-do list today as he won the Verizon P1 pole award for the MAVTV 500 at Auto Club Speedway. 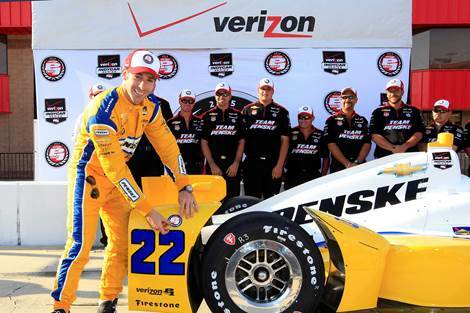 In his first season with Team Penske, Pagenaud had two goals to accomplish – win a pole and win a race. His qualifying effort of 218:952 mph/1 minute, 05.7679 seconds gave the driver of the No. 22 Penske Truck Rental Chevrolet his first oval track Verizon P1 Award. It is the sixth time he will start on the front row this season, and third race in a row. Starting alongside Pagenaud will be Team Penske teammate Helio Castroneves, No. 3 Auto Club of Southern California Chevrolet. It is the 11th time this year that the front row will consist of all Chevrolet Aero Kit with fully integrated V6 2.2 liter turbo charged direct injected engine powered drivers. Team Chevy drivers captured seven of the top-eight starting positions and eight of the top-10 for Saturday’s MAVTV 500 on the 2.0-mile oval. Ed Carpenter, No. 20 Fuzzy’s Vodka CFH Racing Chevrolet, will start fourth followed by series’ points leader Juan Pablo Montoya, No. 2 PPG Automotive Finishes Team Penske Chevrolet in fifth. Chip Ganassi Racing teammates Tony Kanaan, No. 10 NTT Data Chevrolet, and Scott Dixon, No. 9 Degree Chevrolet, will start sixth and seventh, respectively. Defending Verizon IndyCar Series champion Will Power, No. 1 Verizon Team Penske Chevrolet, will start eighth, and Sage Karam will start his No. 8 Comfort Revolution/Big Machine Records Chip Ganassi Racing Chevrolet in the 10th position. The 250-lap/500-mile race is scheduled to start at 4 p.m. ET with live television coverage provided by NBCSN. Fans can list on the IndyCar Radio Network, Sirius 212, XM 209, IndyCar.com, indycarradio.com and on the INDYCAR 15 app.